Perhaps you had GI Joe dolls-excuse me-action figures when you were a kid- or your brother did. Did you know that GI Joe was a real man-a Marine who was born in PA of parents who had come from Serbia? GI Joe named Mitchell Paige a United States Marine was awarded the Medal of Honor for his role in defeating an Imperial Japanese regiment all by himself after all of his fellow Marines had fallen in the fight/action in the Battle of Guadalcanal on October 26, 1942. The rest of the page are his words and the links to some of the pages on the web. Go there and be inspired again by a Real American Hero. We hope through this modern means of sharing ideas, we can be of some service to others to inspire patriotism and an appreciation for what it means to be an American. I will never forget listening to the exciting stories of American history in my school when I was a child. I learned all about the men who gave their lives to make this country free. We had to memorize all the great documents, such as Lincoln’s Gettysburg Address and John Adam’s magnificent, spine-tingling speech given on July 4, 1776, in Independence Hall in Philadelphia, when our country was born. I can recite the speech by memory to this day. Every American should and must be familiar with the trials and tribulations experienced by our great Founding Fathers as they established the very bedrock of the United States of America. VIN SUPRYNOWICZ: G.I. Joe was just a toy, wasn’t he? Paramount will simply turn Joe’s name into an acronym. Well, thank goodness the villain — no need to offend anyone by making our villains Arabs, Muslims, or foreign dictators of any stripe these days, though apparently Presbyterians who talk like Scottie on “Star Trek” are still OK — is a double-crossing arms dealer. Otherwise one might be tempted to conclude the geniuses at Paramount believe arms dealing itself is evil. It’s hard today to envision — or, for the dwindling few, to remember — what the world looked like on Oct. 25, 1942 — 65 years ago. But the Washington’s one-sided battle with the Kirishima was still weeks in the future. On Oct. 25, Mitchell Paige was back on the God-forsaken malarial jungle island of Guadalcanal. As Platoon Sgt. Mitchell Paige and his 33 riflemen set about carefully emplacing their four water-cooled .30-caliber Brownings on that hillside, 65 years ago this week — manning their section of the thin khaki line that was expected to defend Henderson Field against the assault of the night of Oct. 25, 1942 — it’s unlikely anyone thought they were about to provide the definitive answer to that most desperate of questions: How many able-bodied U.S. Marines does it take to hold a hill against 2,000 armed and motivated attackers? You’ve already figured out where the Japanese focused their attack, haven’t you? Among the 90 American dead and seriously wounded that night were all the men in Mitchell Paige’s platoon. Every one. As the night of endless attacks wore on, Paige moved up and down his line, pulling his dead and wounded comrades back into their foxholes and firing a few bursts from each of the four Brownings in turn, convincing the Japanese forces down the hill that the positions were still manned. And that’s where the unstoppable wave of Japanese conquest finally crested, broke, and began to recede. On an unnamed jungle ridge on an insignificant island no one ever heard of, called Guadalcanal. When the Hasbro Toy Co. called some years back, asking permission to put the retired colonel’s face on some kid’s doll, Mitchell Paige thought they must be joking. But they weren’t. That’s his mug, on the little Marine they call “G.I. Joe.” At least, it has been up till now. Mitchell Paige’s only condition? That G.I. Joe must always remain a United States Marine. But don’t worry. Far more important for our new movies not to offend anyone in Cairo or Karachi or Paris or Palembang. After all, it’s only a toy. It doesn’t mean anything. Marine Corps Staff Sgt. Daniel Bogart, leader of the 1st Explosive Ordnance Disposal Platoon serving in Iraq, had just completed the disposal of two IEDs while under enemy fire. A traveling Humvee suddenly detonated another IED mere feet away from Bogart and a fellow team member. The explosion left Bogart’s eardrums damaged, and his fellow Marine sustained shrapnel wounds. As medics attempted to assist the injured Marines, Bogart insisted they stay clear, knowing there was another live IED in the area. Bogart then located and dismantled the explosive device, evacuated his partner, and then came back to conduct post-blast analysis before finally allowing medics to treat him. Habro Toys has 18 pages of GI Joe Real American products for sale-on above link. There are several key facts wrong in this article. The author is just passing along an urban myth. G.I. Joe was not based on a real person. The doll was inspired by a TV show called “The Lieutenant”. The toy was never just a marine. The toy line started with 4 dolls, a soldier, a pilot, a marine, and a navy seaman. Because sales were lagging, within 4 years of the toy’s introduction, the military theme was changed to that of an Adventurer. In the 70’s the adventurer line did better than the military toys of the 60’s. In the early 80’s the new smaller toys were given yet another storyline. This is the one that the movie will be based. It wasn’t until the late 90’s (decades after the toy had been introduced) that there was a special edition G.I. Joe based on Mitchell Paige. That said, Mitchell is a real hero, but that has nothing to do with G.I. Joe, or this movie. Really, 5 minutes of fact checking on google provided the real story. In downplaying or ignoring the American identity of GJ Joe- the heritage, legacy and history of the real men who fought real battles is blurred, negated and perhaps lost to those who might just learn from a simple doll/action figure that history is not just a nondescript date or faceless name to be memorized for a test and forgotten -but rather was a real man who because of his character, principles, ethics and humanity changed the course of history/life as we know it. “In 1964, the character G.I. Joe became a series of military-themed 12″ articulated action figures produced by the Hasbro toy company. The Hasbro prototypes were originally named “Rocky” (marine/soldier) “Skip” (sailor) and “Ace” (pilot), before the more universal name G.I. Joe was adopted. The initial product offering featured members of the four branches of the armed forces as follows; Action Soldier, Action Sailor, Action Pilot and Action Marine. The G.I. Joe name no longer referred to one specific character but to a toy line brand.” http://en.wikipedia.org/wiki/G._I._Joe This was the same time that the company was selling the Action figures in England, France and Germany. In the above listing of “Real American Heroes”—all are American-except Roddy Piper-he is a Canadian Wrestler. In a videotaped interview with the U.S. Naval Institute for its Americans at War program, Ripley said he and about 600 South Vietnamese were ordered to “hold and die” against 20,000 North Vietnamese soldiers with about 200 tanks. “I’ll never forget that order, ‘hold and die’,” Ripley said. The only way to stop the enormous force with their tiny force was to destroy the bridge, he said. Ripley crawled under the bridge under heavy gunfire, rigging 500 pounds of explosives that brought the twins spans down, said John Miller, a former Marine adviser in Vietnam and the author of “The Bridge at Dong Ha,” which details the battle. “A lot of people think South Vietnam would have gone under in ’72 had he not stopped them,” Miller said. Ray Madonna, president of the U.S. Naval Academy’s 1962 graduating class, served in Vietnam as a Marine at the same time and said his classmate saved countless U.S. and South Vietnamese troops. “They would have been wrecked” if the tanks had crossed, Madonna said. He said Ripley also coordinated naval gunfire that stopped the tanks from crossing at a shallower point downstream. John W. Ripley, a retired Marine Corps colonel and a renowned hero of the Vietnam War, was found dead at his home in Annapolis over the weekend, family members said. A cause of death for Ripley, who had undergone two liver transplants, had not been determined yesterday. He was 69. A Virginia native, Colonel Ripley was best known for a daring feat during the Easter Offensive of 1972, when he dangled for three hours under a bridge near the South Vietnamese city of Dong Ha to attach 500 pounds of explosives to the span, ultimately destroying it. 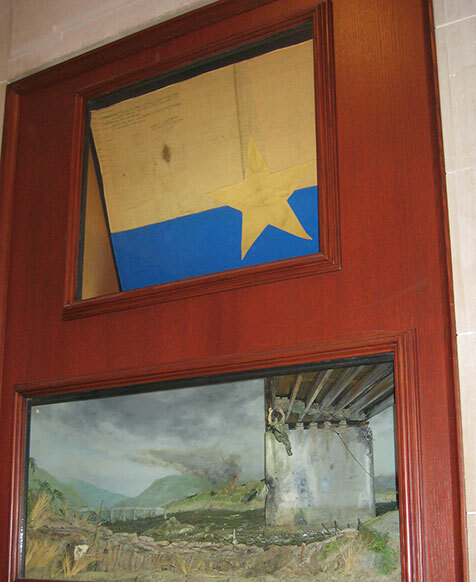 His action, under fire while going back and forth for materials, is thought to have thwarted an onslaught by 20,000 enemy troops and was the subject of a book, The Bridge at Dong Ha, by John Grider Miller. Last week, after he failed to appear for a scheduled appearance at a Marine Corps event in New York, worried associates contacted one of his sons, Stephen B. Ripley, who went to his father’s house Friday to check on him. The younger Ripley concluded that his father – who lived alone near the gates of the Naval Academy, from which he graduated in 1962 – had died in his sleep Tuesday night. “His health was good for someone who’d had two liver transplants,” said Mr. Ripley, who also honored a family tradition by serving in the Marines and retired as a captain. Earlier this year, Colonel Ripley was inducted into the U.S. Ranger Hall of Fame at Fort Benning, Ga., an honor that he added to his many decorations. They included the Navy Cross, the second-highest combat award a Marine can receive; the Silver Star; two awards of the Legion of Merit; two Bronze Stars; and the Defense Meritorious Service Medal. His tale is required reading for every Naval Academy plebe. In Afghanistan, a forward operating base was named for him. Another Marine Corps colleague, Ray Madonna, who served with Colonel Ripley in Vietnam and retired as a lieutenant colonel, said he had known him for almost 50 years and had seen him Oct. 25 at the Navy football game against Southern Methodist University in Annapolis. In July 2002, after unsuccessful transplant surgery, Colonel Ripley’s life was saved by a second operation at Georgetown University Medical Center, in which he received a liver from a 16-year-old gunshot victim in Philadelphia. The surgery became possible only after a high-speed military mission transported the organ to Georgetown in a Marine Corps helicopter from the president’s fleet. Colonel Ripley’s liver had been damaged by a rare genetic disease as well as by a case of hepatitis B that he believes he contracted in Vietnam. Yesterday, on the Web site of World Defense Review, Maj. W. Thomas Smith Jr., a former Marine infantry squad leader who has researched Colonel Ripley’s life, wrote that after Colonel Ripley had set the charges and moved back to the friendly side of the river, the fuses detonated and Colonel Ripley “was literally blown through the air by the massive shock wave” he had engineered. “The next thing he remembered, he was lying on his back as huge pieces of the bridge were hurtling and cartwheeling across the sky above him,” Major Smith wrote. Colonel Ripley was shot in the side by a North Vietnamese soldier and during two tours of duty was pierced with so much shrapnel that doctors found metal fragments in his body as recently as 2001. After Vietnam, Colonel Ripley continued to serve, losing most of the pigment in his face from severe sunburns while stationed above the Arctic Circle. In addition to his son, Colonel Ripley is survived by his wife, Moline; three other children, Mary D. Ripley, Thomas H. Ripley and John M. Ripley; a sister, Susan Goodykoontz; and eight grandchildren.